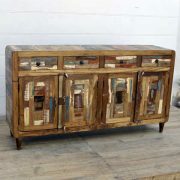 Colourful retro style sideboard with curved edges made from recycled materials. 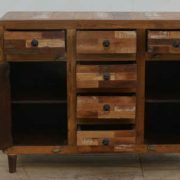 Made using recycled wood in Rajasthan, one of India’s most colourful regions, this large retro style sideboard does not disappoint. The curved edges of the main unit and the cupboard doors, alongside the slim wooden feet, give the eye-catching piece a 50’s feel. 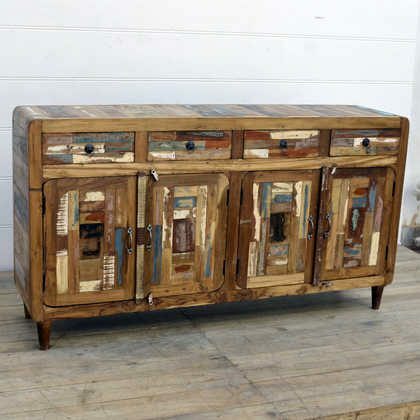 The collage of reclaimed blocks of timber creates beautifully vibrant colourful patchwork of blues, beiges, purples and many other colours in combination with natural wood grain of varying species. 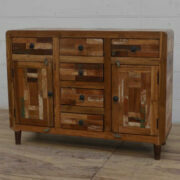 The sideboard has four spacious drawers, each with a sunburst ring handle. 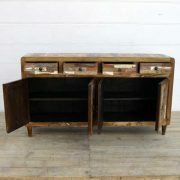 Below the drawers are two cupboards, each with two doors each and one internal shelf, creating two spaces for storage. 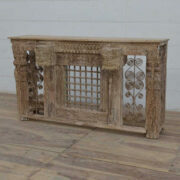 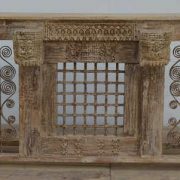 A fun, colourful piece with soft edges and a lot of character, this sideboard would look wonderful in the right hallway, dining room or living room.